After a week of relaxation mixed in with a few more post lightning repairs and more vessel clean up we departed for Linton just a few miles away. Linton, we had visited on our way to Colon, was our final point of stock up before leaving for the San Blas en route to Cartagena, Columbia. Our visas expire on 2 October, less than 6 weeks away. A couple of days in Linton, mainly because it rained all day the first day, then we headed 42 miles to Chichime Cays at the Western end of the Archipelago De San Blas. 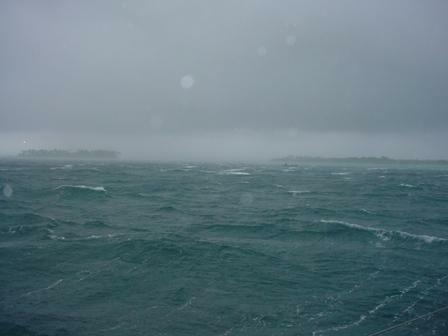 After clearing the bay we headed almost due East for the short trip and, with almost a Southerly wind, sailed. A beautiful fairly clear day a few miles off the coast. The weather here is quite unique in that the narrow mountainous Panama isthmus separates two oceans that differ in temperature about 5 degrees. More often than not it will be raining on the land yet a mile or two to sea it is fine. As we sailed we could see the bands of rain moving along the mountains and shore line but we did not get wet. 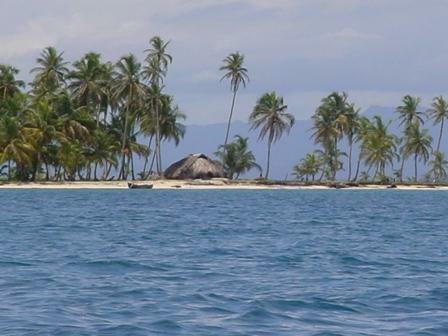 We had not caught a fish since leaving the San Blas two months ago and I was determined. Tried trolling different lures at differing speeds and differing lengths of line out while altering course to take us over some of the shallower, under 10m, shoals. After hooking a “stick” fish, then a “log” fish I finally hooked a real one but it got off. Sasha had just bought lunch out to the cockpit when the reel went off. We landed a giant, well over a foot long, yellow tail snapper, just right for two for dinner. So it was that Sasha did pan fried whole fish with carrot potato and yucca - beautiful. In comparison with last time we stopped in Chichime, this time there was room to anchor without being too close to others and the next morning 3 of the 7 boats that were in the anchorage left anyway. Editor's note: We lost the camera in Cartagena with all the photos taken in this period. The photos in the journal are taken by Gigi, so unfortunatley do not reflect activities described in this Roger's journal. Finally we were back to sunny days, cool breezes and gorgeous sun rises and sets. Clear water to swim in, coral and fish in abundance. Clear shallow reefs all around the two small islands that themselves are only about 100m or so in diameter, provide for endless snorkelling over the couple of days that we spent there. Gigi and Lulu decided to head for Hollandes Cay to catch up with their Aussie friends Alan and Dee on Sunflower. We opted to look around some of the other island groups, the East Lemons, the Lemons, Dog Island, perhaps Carti group, Los Grullios and Gunboat. 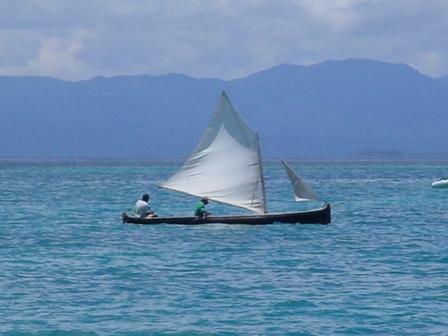 It was a very short couple of mile sail, well motor, to the East Lemons where we picked our way through the coral and shallow weed banks to anchor between two small islands that were about 300m apart. One, about 30m in diameter had 3 huts, no trees and was defined by a small rock wall around its perimeter. Lucky there is only a max half metre tide, won't last long with global warming! Kunas were coming and going in their Ulus, dugout canoes, generally with just one person paddling. They came over to us for fresh water and we bargained a couple of very small lobster for sugar. 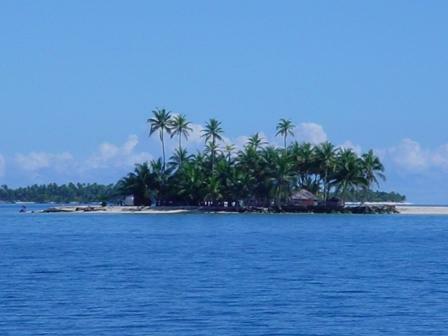 Next morning we took the dingy over to another small island with only one palm tree, less than a mile away. It was calm and reasonably sunny, perfect for snorkelling so we spent an hour doing a snorkel circum navigation. Beautiful reef and oh so many fish. Later in the day we headed for Dog Island but instead of taking the guide book recommended route, decided to find our own way in more or less a straight line to the Island through coral bombies and sand shallows. In trying to cross one bank the echo sounder showed the bottom up to 2m where upon the skipper chickened out and backed off. With no wind we were motoring the 3nm to Dog Island. When we arrived at the anchorage there was a large, 150 to 200 foot, three mast charter schooner anchored, ferrying people to and from Dog Island. On the island the Kunas had set up a major trading activity selling Molas. The main attraction for us was the dive site, a small coastal trading ship that had been beached as it was taking to much water for the pumps. Now it lies in a few metres of water. We went for a short, shallow, SCUBA dive but nothing too exciting to see. 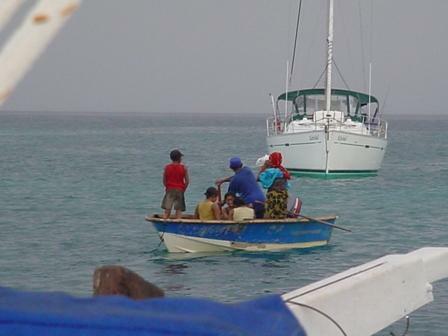 The guide book did not recommend the anchorage for an overnight stay so we headed around the corner for the Lemon Cays. This was supposed to be a popular spot but there was only one other yacht that left shortly after we arrived. Other than a small jetty and a couple of almost western style building it was certainly nothing special. Special however was the Kunas who came by with large crabs, we bought two, one for dinner and one to keep in our home made holding drum tied to the stern. Sasha made another version of chilli mud crab, this time Singapore style, absolutely magnificent. From the Lemons, next morning, we headed to the Los Greillios group where, on Kuanidup Island there was reported to be the one and only Kuna style and Kuna run holiday hotel. Apparently one can go ashore and make a dinner booking for a truly local style meal. After spending some time trying to find a reasonable spot to anchor as the bottom around the island was almost all coral and the few sand patches had only a very shallow covering of sand we finally set the pick. A dive showed the anchor to be in some sand but not really enough for the anchor to dig into. Well, if it blew during the night the anchor would soon hook a coral bombies, something we do not like due to the coral damage it can cause. Ashore in early afternoon we caught up with the boss and with very limited Spanish, booked in for dinner, fish and rice it seemed. The “resort” was very much in keeping with Kuna living. Hotel “rooms” were standard Kuna thatched huts with a bed (usually a hammock, sand floor, door and windows. Windows have no covering, no glass, just a square hole in the stick wall. Yes walls, as with normal Kuna huts, are tree sticks or bamboo tied one next to the other, keeping out most of the rain while allowing breeze through the hut, it all remains amazingly cool in the heat of the tropical sun. The toilet were a departure from the more common Kuna. They looked like some sort of septic system as distinct from the island Kuna villages that have the toilet as a sort of out house over the sea so that everything just goes into the water. Doesn't make swimming too inviting! The “restaurant” was a long hut, sand floor, tressel type tables down the middle with some plastic chairs and some bench seats. We would sample soon. Our “dinner appointment” was for 7:00. Near the hour, Sasha in dress and sandals, me in shorts, shirt and thongs, we jumped in the dingy to head for dinner, complete with beer, wine and glasses just in case it was a dry dinner. We joined several others, presumably hotel guests, some more formally dressed, shorts, no shoes, no shirt, in the restaurant hut. The food was simple but delicious, fresh garden salad followed by deep fried whole fish with coconut rice and wonderfully sweet pineapple slices for desert. Not the Hilton but a memorable dinner, Kuna style. The following morning we prepared for the short 10 mile trip to the Hollandes Cays where Gigi and Lulu had anchored with Dee and Alan on Sunflower. I noticed that our crab holding drum was floating, must have got some air in it. Uh uh, tonight’s dinner had escaped. Seems the flap style opening I had made was not crab proof, despite the fact that it was always difficult to get the big crabs into the drum through the 20cm by 20cm flap I had cut in the side. Oh bugger! By early afternoon we were picking our way through the narrow shallow passage into a huge lagoon area, well over a mile in diameter, surrounded by reef and 7 islands. To the north was open Caribbean Sea but with less than half a metre tide and a partly exposed barrier reef it was like being on a river, no swell or surge at all. 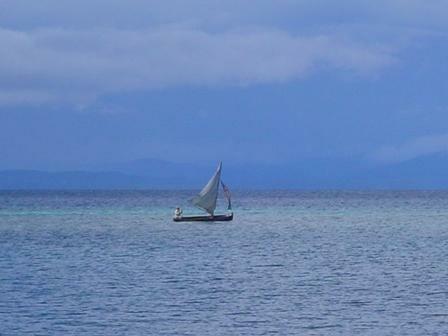 We anchored a respectable 150m or more from the other two boats in 7m of water with a coral reef about 60m behind us. Here we spent 2 glorious relaxing weeks, swimming, snorkelling, fishing and socialising with views of ocean, islands and the mountains of Panama in the background. Almost every morning we swam from the boat to and around the coral bombies not far away. There were hundreds, maybe thousands of fish that we would just float over in 1 to 2m of water and watch. Some were territorial and spent most of their time chasing others away from their little coral home patch. Others swam past in huge schools, most were small, a centimetre or so up to 20 or 30cm. Some brightly coloured, others almost perfectly blended in with small pieces of sea grass, it was fascinating. There was however a down side, rain thunder and lightning. On average we had lightning and rain about every second day. An hour or two of rain is no problem but lightning, especially in the early hours of the morning, is another matter. When it was far off the lightning made a wonderful sky show but when close, especially given our recent experience, it was truly frightening. Now however we had a routine! Having installed plugs and sockets to all the cables going up the mast, our normal situation was to have all mast mounted equipment, antennas, lights, radar, disconnected, along with the back stay mounted HF radio antenna. Items were only connected when we needed them. In addition we had our stainless steel lightning protection “dunny brush” mounted above the aerials on the mast head. The theory being that if we got hit again then lightning volts may not get to our electronics. Fat chance I hear you say, my feelings too but we have to try something. One evening we went for a night snorkel over the reef close to the boat. Since we had swum the area many times I didn't think there was much chance of becoming disorientated. We had seen a few lobster under some of the coral bombies and thought we may pick up a couple. It was just wonderful. We both swam around with many of the larger fish coming very close, guess they were disorientated by the torch light. While we saw several lobster, most were small but I did manage to get one reasonable size to go with our T bone steak for dinner. The other notable night life was the sea urchins, the spiny things were now out in the open, needed care not to touch them.